I think it’s safe to say that Facebook is the leader when it comes to collegiate and high school social networking. I expect that won’t hurt anyone’s feelings. When it comes to meeting people at college, beer is always a good choice, or there’s Facebook, or some may now prefer LikeALittle. While social networking is essential on any campus, there are also a few tools social networks can integrate to become a more useful resource for students. Take it from CampusBuddy, which offers college students a social platform where they can also access official grade records and view comprehensive reviews about professors, classes, departments, and campuses. It’s a great resource for high school students looking for a deeper dive into colleges they’re considering, as they can tap into admissions data and real student feedback about prospective schools. Or, because CampusBuddy has official grade records for classes (the platform currently has over 80 million grades from hundreds of institutions), students that are looking to get more information on how difficult certain classes are can view grade trending data with a few clicks. You can read our initial coverage of CampusBuddy here and follow-up coverage here. And since its launch in 2008, CampusBuddy has been seeing some good traction on campuses across the U.S. The startup’s founder and CEO Mike Moradian tells me that, between its website and Facebook app, CampusBuddy is at over 200K monthly active users, with over 1.5 million total, and revenue has quadrupled over the last year. 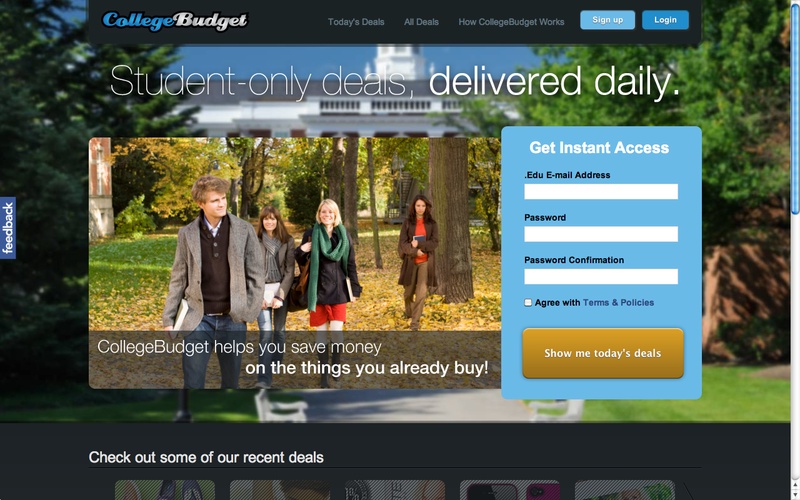 Thanks to this growth, CampusBuddy is launching a new initiative called CollegeBudget, which aims to bring daily deals and group buying to campuses across the country. With the exploding popularity of daily deals, Moradian says, this wasn’t an opportunity to miss. But, more importantly, he thinks that it’s a great way for students to lower the cost of their college experience. In addition to student deals, CollegeBudget is looking to bring social buying to every level of the campus experience, including textbooks and student loans — and one day in the future, potentially tuition. The company is kicking off its public launch with “Back-to-School Palooza”, which will feature over 100 merchants offering deals at 50 percent (and higher) discounts. There are deals on admissions books, posters, iPhone cases, etc. But it’s only for college students; you have to have a working “.edu” email address to sign up. Since launching in private beta in March, CollegeBudget has already signed up 600K college students from the CampusBuddy platform, and has already saved college students over $1 million collectively. Moradian tells me that he thinks CollegeBudget will be appealing to brands looking to tap into the highly-coveted college-age demographic. The platform also offers brands social media marketing campaigns at no cost, so that merchants signing up to offer student deals receive a YouTube testimonial video made by a college student, as well as social media blasts to CollegeBudget’s 130K-plus Facebook fans and Twitter followers. YouTube testimonial video made by a real college student, and social media blasts to CollegeBudget’s over 130,000 Facebook Fans and 3,000 Twitter Followers. Here’s an example of the type of YouTube marketing that’s included in the platform. It’s a great resource for college students looking for targeted discounts on the stuff they need while at school, and for brands, they have a built-in access to students, and for CampusBuddy, which was primarily making money through textbook sales, subscriptions and advertising, it will provide another source of revenue. In terms of the cut CollegeBudget will be taking from deals, Moradian tells me that the site is trying to make the experience as easy as possible on merchants and will be flexible on their cut in an attempt to accommodating different industries. But, on average, it will be offering merchants 60 percent. CampusBuddy is fully bootstrapped at this point, the founder says, and isn’t in any hurry to raise, as they’re “big believers” in the bootstrapping method. Which is a breath of fresh air. Oh, and as an addendum: CollegeBudget mobile apps are coming soon. Merchants can sign up to offer student discounts here.